If you are in search for an application to create photo slideshows and to share photo slideshows online then PhotoPeach may prove a nice option for you. The creation is quick and easy. PhotoPeach can easily import your images from Facebook and Picasa. It’s a free tool, but users with advance requirements can opt for the premium plan available at $3 per month. The created online slideshows can be easily used over websites and blogs using the embed code. In the following section, we have included a short review on features of PhotoPeach online slideshow maker. You can begin by filling a simple registration form or opting for a direct Facebook login at PhotoPeach. In no time the quick upload interface will be presented to you. 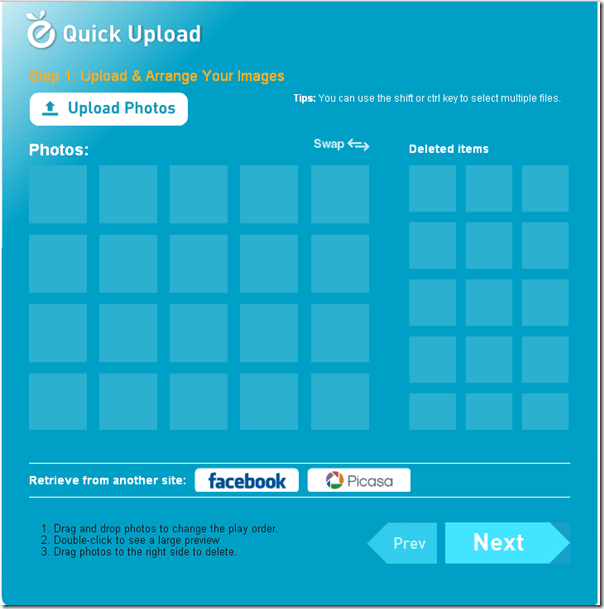 Now, hit the upload button to upload the images files from over your PC. The time needed in uploading will depending upon the combined size of the images and your bandwidth. Once you have successfully uploaded the files then arrange them by dragging. Incase, you have included an imaged that you don’t want to appear in the online slideshow then simply drag it to the section for deleted items. After arranging the images over PhotoPeach online slideshow maker you can not click the ‘Next’ button to finalize the slideshow. Provide a title, add description, set the slide transition speed and select the background music. You can choose the tracks from the list or upload the mp3 of your choice. PhotoPeach can also extract the music from YouTube. For that simply specify the URL and PhotoPeach will fetch the audio out of it. Finally, all you require is to deliver a click over the ‘Finish’ button. View it and at anytime you feel like editing then simply login over PhotoPeach and make the changes. PhotoPeach also adds a short summary to the end of every slideshow. The created slideshow can be easily shared over social media or by sharing the link through email. The thing that distinguishes this online slideshow maker from others is that the slideshows page includes a download button as well, but works only for premium account holders. Also, check out our post on tool to Create Personalized Email Templates. * It must be noted that an updated flash player is the primary requirement for making as well as watching slideshows over PhotoPeach to create slideshows online. Definitely, PhotoPeach is a useful slideshow making application with an easy interface. We have no issues in recommending PhotoPeach to our readers. The simple suggestion is to give it a try.